David Altig studies monetary and fiscal policy issues. Examples of Altig's papers include “Firm Specific Capital, Nominal Rigidities, and the Business Cycle,” written with L. Christiano, M. Eichenbaum, and J. Linde, which is forthcoming in the Review of Economic Dynamics, "Simulating U.S. Tax Reform," written with A. Auerbach, L. Kotlikoff, K. Smetters, and J. Walliser, which appeared in the American Economic Review; and "Marginal Tax Rates and Income Inequality in a Life-Cycle Model" written with with C. Carlstrom, which was published in TAmerican Economic Review. 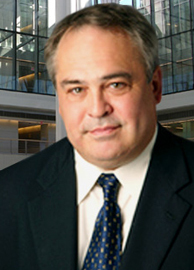 Altig is currently the Senior Vice President and Director of Research at the Federal Reserve Bank of Atlanta, and previously served as the Vice President and Associate Director of Research in the Research Department of the Federal Reserve Bank of Cleveland. Prior to joining the Chicago Booth faculty as an adjunct professor, Altig was an assistant professor in the department of business economics and public policy at Indiana University He has lectured at institutions across the country, including Brown University, Duke University, Case Western Reserve University, and the University of Iowa as well as the Chinese Executive MBA Program sponsored by the University of Minnesota and Lignan College of Sun Yat-Sen University. Altig earned a bachelor's degree of business administration in economics from the University of Iowa in 1980. He received a master's degree in 1982 and a PhD in 1987 in economics from Brown University. With L. Christiano, M. Eichenbaum, and J. Linde, “Firm Specific Capital, Nominal Rigidities, and the Business Cycle,” Review of Economic Dynamics (forthcoming). With A. Auerbach, L. Kotlikoff, K. Smetters, and J. Walliser, "Simulating US Tax Reform," American Economic Review (2001). With Charles T. Carlstrom, "Marginal Tax Rates and Income Inequality in a Life-Cycle Model," American Economic Review (1999). With C. T. Carlstrom and K. J. Lansing, "Computable General Equilibrium Models and Monetary Policy Advice," Journal of Money, Credit, and Banking (1995). With Steven J. Davis, "The Timing of Intergenerational Transfers, Tax Policy, and Aggregate Savings," American Economic Review (1992).